It is reported that there is high possibility that Japan-India nuclear agreement will be signed at the time of Prime Minister Abe’s visit to India in coming December. the voice of criticism has been raised from inside and outside Japan that the agreement between two countries, India which does not participate in the Nuclear Non-Proliferation Treaty (NPT) and the Comprehensive Nuclear-Test-Ban Treaty (CTBT) and Japan which was suffered by atomic bomb in the war, overturned Japan’s nuclear non-proliferation policy and impairs the efforts for the nuclear non-proliferation of the world. 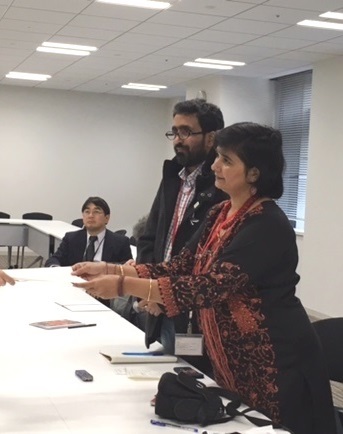 Mr. Kumar Sundaram and Dr. Vaishali Patil, who have been tackling for abolition of nuclear weapons in India and are visiting Japan now, visited the Cabinet Office and the Ministry of Foreign Affairs of Japan on November 26 to submit a letter from NAAM:National Alliance of Anti-Nuclear Movement to ask not to make Japan-India nuclear agreement. The letter addressed to Prime Minister Abe and the Japanese parliamentarians pointed out that nuclear power bring risk to life and environment in various ways and nuclear power is not sustainable energy. It asks Japanese government to invest more for renewable energy not for nuclear power. After talking about the situation in Jaitapur where residents have been oppressed by the government in the movement against construction of the nuclear power plant, she said,”Please think well what it means by making a nuclear cooperation to India under such circumstances”. Mr. Sundaram criticized that “Japan-India nuclear agreement will shake the NPT regime in the world” and pointed out that “introduction of nuclear power generation which is large scale, centralized and benefit the huge capital will make rich one more rich and poor one poorer. It endangers the local inhabitants “.